I encountered Jenny Rowbory on twitter. She'd organised a quirky little game to guess the colour of Jeremy Paxman's tie on University Challenge. I don't think anyone ever got it right. Shortly afterwards she tweeted about her poetry book, Rainbows in my Eyes, being launched, and after discovering her story, bought a copy. The first thing I encounter on opening the book is Jenny. She is lying in bed, her face tipped upwards to the the camera, her hand reaching downwards to stroke a golden-haired dog. Her face is framed in dark curls and she has a bright smile. Underneath I read that she was born in 1986 and is therefore only 23 or 24, and since starting university in 2004 has been so ill that she is now bed-bound. 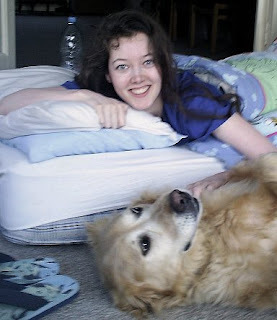 This intelligent young woman is suffering from severe Myalgic Encephalomyelitis (ME). Her poetry evokes her world. It is, necessarily, a restricted one. For instance, in 'A fleeting visit' she describes the 'fixed portion of the world', her 'rectangular allocation of life' that is her window. All she can see are the tops of trees and so when birds visit it is a welcome and significant change of scenery. In 'Sleep Pod' she appreciates the other essential element of this world - her bed - because it allows her to escape into sleep; while 'Dayspring describes the 'stunning shock of truth' on waking. In 'Blur' she evokes simply and effectively how it is to spend your life waiting - waiting that is for something to change. Mostly though she seems to retreat to some place inside. In 'My Day' she describes how she 'breaststrokes through the air' and there are two wonderfully surreal poems: 'Quest for the Holy Grail', which is a metaphorical piece about someone who has captured 'Health' and is holding it captive in a chair; and 'The Rainbow Bird' which is about a beautiful bird that is plucked of all her feathers. The denuded bird goes through years of suffering alone, until a butterfly notices rainbows in her eyes and wonders how they can still be there. She explains that her light comes from within and if the creatures of the world take time to know her they will have her light too. 'Will you tell them for me butterfly? And now, thanks to Jenny Rowbory's talent and persistence (and twitter, blogger and Longman's Pearson Project who published the book) we hear and read about them too. Money from the sale of this anthology will go towards Jenny Rowbory's medical costs. You can buy a copy here (includes a link through to Amazon as well as direct). Jenny Rowbory was born in 1986 in Ashford, Middlesex, and currently lives in Suffolk. After attending ten different schools she went to university, however, during her first year in 2004, she became ill with a virus that caused severe M.E. (Myalgic Encephalomyelitis: inflammation of the brain and spinal cord). M.E. affects all bodily systems, causing Jenny to be bed-bound and unable to sit up because of strain on her cardiovascular system. CD: When did you start writing poetry? JKR: I started writing poems when I started 6th form. I hadn't chosen English as an A-level subject (I chose Ancient Greek, French, Chemistry and Biology) and was frustrated without a creative outlet. One time I found myself typing a poem on the computer in the middle of a piece of chemistry homework (which I had to delete before handing in to the teacher of course)! Writing poems just seemed natural to me, like they needed to be written. It still feels that way now. When I have a poem knocking on the doors of my mind, it gets louder and louder until I open the door and release the words onto paper. I actually wrote a poem about this in my book 'Rainbows in my eyes', called 'Lost in translation'. Sometimes whole poems just pop into my mind fully formed, other times I start with an idea and then develop it. Now I'm ill, thinking is just about all I am able to do, so I still write about what I have been mulling over. CD: When do you write it now? JKR: Most of the poems in 'Rainbows in my eyes' were written a few years ago - I was severely ill, but not as bad as I am now. So at the moment I rarely write poems as my heart begins to fail at any slight movement. CD: What effect does it have on you? JKR: I don't think it has any particular effect on me. As I mentioned earlier, it feels like I've released a poem from inside me that needed to be written. I enjoy words and have an extremely vivid imagination, so it needs some sort of an outlet. CD: How do you write your poetry? Do you dictate it or are you sometimes able to write yourself? JKR: The poems in 'Rainbows in my eyes' were handwritten by me over the last four years, which my Mum kindly typed up onto a computer for me. Now I have something called a Space Pen which is able to write whilst tilting upwards (unlike normal pens which just stop working), so I can write whilst lying flat (I'm unable to sit up), but I am rarely even able to use the Space Pen now. CD: I think my favourite poems are where you express the limitations of your world. I particularly like the beautiful simplicity of the lines in 'Blur' and the way it expresses the idea that time is something that can change. When do you find time moves most quickly? JKR: When you are ill and unable to move, time does seem to move very slowly. For most people, time moves fastest whilst they are enjoying themselves, but there's no enjoyment in being this ill! So I guess for me time moves most quickly either when I go into my imagination and make up stories or when I am well enough to watch a TV programme/film that I enjoy. CD: I was also much impressed by the surreal qualities of 'Quest for the Holy Grail'. In it the idea of 'Health' has become a something bound up in a chair even though its captor denies that anything is there at all. You wake to find an NHS doctor. What has been the response of the NHS to your condition? The UK and NICE are on record as not acknowledging the World Health Organisation's classification of M.E. as a neurological disease (disease of the brain, spinal cord and nerves). Unfortunately this all means that the NHS's treatment approach is based on the should-be-void psychosomatic model of M.E./CFS. As far as I'm aware, the NHS only offers two “treatments” for M.E. : CBT (Cognitive Behavioural Therapy) and GET (Graded Exercise Therapy). There is real concern that not only is CBT ineffective, but that GET is potentially harmful to patients with ME/CFS. It is known that GET may leave up to 82% of ME/CFS patients who have undertaken it irreversibly house or bed-bound. If sufferers want any biomedical treatment, we have to go to a private doctor, which most patients can't afford. Many of my NHS doctors have just said that there's nothing that they can do for me and left me to suffer. I have had experience of many GP surgeries coming on home visits to see me, as we live in rented accommodation and so move house quite a lot (and therefore have changed surgeries a fair few times). All the doctors have the same response. CD: Another favourite is the longest poem in the book 'The Rainbow Bird'. It contains some beautiful lines and I can see exactly why you decided to call your collection 'Rainbows in my Eyes'. What do you hope readers will gain from reading your poetry? JKR: The meaning behind a poem that I might have intended does not matter. Whatever meaning the reader takes from a poem is the important thing. Their response and reaction to a poem is just as valid as whatever I might have intended. They might find it interesting to discover what I actually meant, but that does not invalidate their interpretation. I often write my poems in the first person, even if I don't mean to speak about myself or my situation. This is because I want the readers to put themselves into the poem, so that they apply the poem to themselves and to whatever is going on in their own lives. Even when I write about my own suffering, I intend the reader to identify with it and apply it to any suffering or troubles in their lives - we all suffer in some way. CD: Do you have any connection with snails? JKR: Not really. Only that when I was young and picked snails up, I really wanted the snails to poke their head out of their shells so that I could see them, but they rarely ever did! One of my best friend's worst sounds is that of a snail's shell being crushed (for her, it's like fingernails being scraped down a blackboard). CD: What is your proudest moment? JKR: It's funny how I can never think of a specific moment when asked. I guess it was when I received the best A-level results in my school and got a letter from the examining board saying that I had achieved 100% in one of them, coming joint highest in the country. CD: Have you ever had a life-changing event - if so what was it? This has been my life 24/7 for the last 5 years: Bed-bound and unable to sit up because every slight movement, even talking, causes me to go into heart failure; chest pain and pain in the left arm; heart straining to pump; severe headaches that mean even a tiny movement of my head causes agony to shoot through it; dizziness so great that it causes the room to swim; muscle pain and debilitating exhaustion especially in the arms and legs, making it so difficult to move them; insomnia - 2 hours broken sleep per night is about the norm; chronic constipation; painful and swollen glands and lymph nodes; a constant low grade fever; poor digestion and absorption; agonising stomach pain; spine pain; muscle twitching…This is severe Myalgic Encephalomyelitis (M.E. ), which means inflammation of the brain and spinal cord [absurdly M.E. is also called Chronic Fatigue Syndrome (CFS)]. My life involves just about managing to prop myself up enough to eat, getting to the mini portaloo in my room (a remnant from our camping days), shuffling to the bathroom a couple of times a week to wash lying in the bath under the shower. All these “activities” cause my symptoms to get even more severe and I have to lie still in between them in order to be able to do them. My treats involve watching a bit of television from my bed and going on Twitter on my iPod whilst lying flat. CD: What is the saddest thing you've ever heard of or seen? JKR: There are so many people suffering in the world; I don't think I could single out any one thing/person in particular. There are so many stories I've heard of injustice and corruption and suffering. CD: If there was one thing you'd change about yourself what would it be? JKR: To think of others before I think of myself. I'm working on it! JKR: Happiness is to be with the people whom you love and who love you (i.e. to love and be loved). CD: What do you do first thing in the morning? JKR: I open my eyes (hehe). Sounds like a very interesting young woman. I don't know how I'd be able to cope being so debilitatingly ill and bedridden for such a long amount of time. Congratulations to her on getting published and all the best to her for raising the money she needs for treatment at the specialist hospital. Is great you have posted extracts of Jenny's poetry, I am very keen to read her book, and have encouraged her to post extracts on her blog, though I know she depends on others to update her site. Is fabulous she got her collection published, I will link to this review. Sally: Exactly - Jenny Rowbory is clearly an admirable young woman, and despite her illness is already making a contribution to the world through this book. 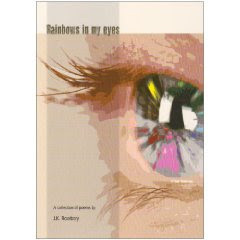 Thanks nmj - Rainbow in my Eyes is very much worth reading. Gosh! And to think I complain when I have to stay in bed a week because of the flu. It must take remarkable strength not to despair. It's wonderful that Jenny has written such honest poetry, giving us an insight not only into her life, but the lives of all the invisible millions who suffer chronic illnesses, who it's so easy to forget about. I have read her poems and was very impressed. I have to admit I interpreted some of them differently to you Clare! The rainbow bird I took to be a metaphor for Jesus, his death and resurrection. And the light living inside to be God's spirit. When it says 'spirit to Spirit' I took that to mean God's spirit (the Holy Spirit or whatever you're meant to call him!) living inside us, interlocked with our own spirit. Maybe Jenny could clarify if she's around? Though as she said in her interview, any interpretation is valid. Also, I took 'Let me in' to be about how we all put up barriers and hide our true selves from each other ('You've all twizzled layers of bubblewrap around yourselves'). So I didn't take that one to be about God at all! I think my favourite is 'The librarian' - it made me cry! Thanks Margaret - yes I agree completely about Jenny's strength, honesty and insight. As for the interpretation - yes, that is the good thing about such works. It is an interplay between reader and poet, and each of us will have a different interpretation depending on our own experiences and beliefs. I have a friend who suffers from this affliction although not to the same extent as this remarkable young woman. The NHS's treatment of these afflicted souls is nothing short of diabolical. Well said, Mr Wednesday! Thanks for your comment. She looks so joyful in the photograph, doesn't she? Interesting that the one thing she would change doesn't turn out to be health. Yes, Marly - and that is such an interesting point about the 'one thing'. I think it emphasises how remarkable she truly is! Hi Marly! If the question had been 'If you had one wish, what would it be?' I would have definitely said without hesitation 'to be made completely healthy, right here right now'! But I thought Clare's question of 'what's the one thing you'd change about yourself?' was referring more internally/personality-wise! Also, I don't regard the illness as being part of me. "I am not my illness" is one of my mottos. So when asked what I'd change about myself, I wouldn't think of my illness - it wouldn't even come to mind because I don't view illness as part of 'myself'. Yes, Jenny - excellent point! Unravelling the Silkworm's Genetic Fibre.